These are pretty much always called Phantom Crane Flies. Tibia: A middle segments in the leg of an insect, located between the femur and the tarsus.) are greatly enlarged and help catch the wind. The legs usually have white tips, making them very easily identifiable in flight. 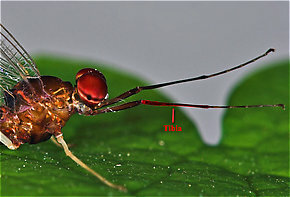 There is a ghostly look to a dark, sparse insect flying around the stream, usually alone, with the fixed bright white points of its leg tips surrounding it like a halo.